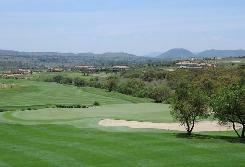 Royal Johannesburg Golf Course offers the visitor two 18 hole options. The World Atlas of Golf, which lists the great courses and how they are played, features just two South African clubs on its hallowed pages. One is Durban Country Club and the other is Royal Johannesburg, which was established more than 100 years ago. 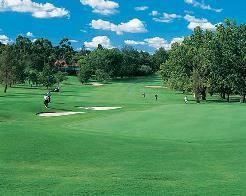 It was initially known only as Johannesburg Golf Club. The club was granted the 'Royal' prefix by King George V in 1931, two years before a second 18-hole course - now the more famous East layout - was built alongside the existing West course. The East Course is a championship layout that has hosted 7 South African Open Championships, the SA Amateur and numerous other Tour events. Played off the Championship tees it measures 6846 meters, and a more user friendly 6382 meters off the Club tees. Famously or infamously the 10th and 11th holes are reputed to be the two longest back-to-back par fours in the world. Signature hole: of the East Course is the par four 11th hole. The hole is telescoped by huge poplars that make the lower holes on the East Course so spectacular. A tee complex of 5 tees changes both the angle of attack and the length (from a monstrous 457 meters to a relatively tame 382 meters). The second shot is a challenging long iron across water. 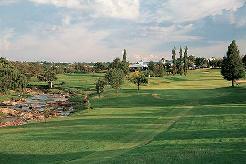 The West course was the site of the Johannesburg Golf Club when it first moved to the current premises in 1909. Over the years it has been upgraded and its major revamping was in 1999. The West Course, in comparison to the East Course, is a fine example of how two layouts in close proximity can still create quite different, but vastly enjoyable golfing experiences. Although measuring a few hundred meters less in overall length than its neighbour, the West Course doesn’t seem to play much shorter. Experienced golfers may find the easier holes a touch more forgiving, but the thrill of going for birdies is often tempered with punishment for even a small inaccuracy. Signature hole: on the West Course is the 4th hole . A tributary of the Jukskei River fronts the green and is very much in play along the left hand side of the fairway. The hole, like the West course itself, is enchanting against the backdrop of Linksfield Ridge.